"You can mess with him. But don't mess with his water." Bobby Boucher, a mentally disabled young man with a good heart wants nothing more in the world than to play football but his strict mother won't let him claiming that the sport, as well as most things in the world, is evil. After becoming the water boy for the Louisiana University Cougars he is bullied and soon fired. Bobby then becomes the water boy for the failing South Central Louisiana University Mud Dogs, whose coach Klein lost his passion after his playbook was taken by the rival coach. Bobby is bullied here, too, and after he lays a bully out with a tackle, Coach Klein asks him to join the team. He does so secretly so that his mother won't know he becomes a linebacker. The Mud Dogs win several games until they are set to compete with the Cougars in the Bourbon Bowl. Meanwhile, the Cougars' coach finds out that Bobby lied and never actually finished high school. Bobby's mother doesn't want him to go back to the university, but Bobby completes the GED exam anyway. His mother fakes sickness to coerce him into staying with her. When she sees how the townspeople genuinely care for him she changes her mind and explains to him that his father really abandoned them and she didn't want Bobby to leave her too. Realizing how happy he is she gives her blessing for him to play football and play in the championship game. Arriving at half time, Bobby stirs his teammates to a comeback after their losing first half and teaches Coach Klein not to be afraid of his nemesis, the Cougar's coach. Getting over his fear allows him to make up amazing plays that help the Mud Dogs take the lead and win the game. When Bobby happily marries his childhood sweetheart Vicki Vallencourt he also gets the opportunity to confront his deadbeat father. 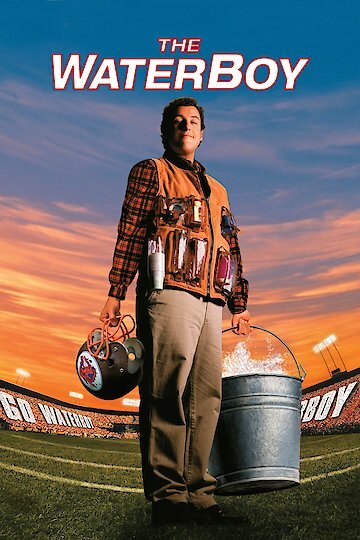 The Waterboy is currently available to watch and stream, download, buy on demand at Netflix, Amazon, Vudu, Google Play, iTunes, YouTube VOD online.